Last year I wrote a series of recipes I called "Thanksgiving Basics" in case you're far from home or hosting Thanksgiving for the first time and just want to keep it classic and simple. You can find them all here. This year I'll be doing things a little more travel inspired for our second annual big expat Thanksgiving (we'll be hosting around 25) but definitely keeping some of the classics in the mix. Our 3rd Stop: Thailand, where I bought our star anise heavy five spice powder or China, where five spice comes from. I grew up eating plenty of sweet potatoes as baked potatoes but the classic marshmallow topped candied yams never graced my Thanksgiving table so even the recipe I wrote last year isn't the most traditional. I love sweet potatoes and I love home-made marshmallows so I figured there had to be a way to make this dish my own. Unfortunately, when I did a more traditional casserole with my homemade honey five spice marshmallows (delicious, and will definitely get a write up of their own) they just totally melted without browning. I'm not entirely sure why. It also was so sweet when I tried it, I just couldn't imagine serving it with the main course and decided to revise and make a dessert. I remembered a few years ago, I worked at a catering company where we had a bride specifically request this Martha Stewart cake with it's toasted marshmallow frosting and I knew that was something I could make my own that would stand up to either a torch or a broiler. I will say, even as a dessert, this ends up being a little much for me, but if you've got guests know for their sweet tooth, this is bound to be a winner. *I've found two types of sweet potatoes in Korea. The smaller, more widely available ones are too starchy to work well for this recipe. The ones to use are the "pumpkin sweet potatoes" (which can be found at Costco this time of year) which are more similar to American varietals but still a little on the starchy side. I bet this recipe turns out even better with soft US sweet potatoes. I think if I do this again with Korean sweet potatoes, I'll probably cut out the flour. Bring a large pot of water to boil. Peel and cube your sweet potatoes. Cook until fork tender and drain. In a large bowl, mash potatoes with a fork or potato masher. Mix in butter, salt and spices. In a separate bowl, use a stand or hand mixer to whisk together yolks and sugar until pale yellow and creamy. Fold into the sweet potatoes. Next mix in the flour and then the cream. In a clean bowl, use a stand or hand mixer, whip egg whites to soft peak. Fold 1/2 the egg white mixture into the sweet potato mix. Repeat with the remaining half until just incorporated. Divide sweet potato filling evenly between the six tartlets. Bake for 25-30 minutes or until the center is just set. Transfer to a wire rack and let cool completely. Once cool, you can store for 24 hours in an airtight container before adding the fluff. While the eggs are beating, heat sugar, honey, five spice, salt and water to 235 Fahrenheit. Immediately remove from heat. squeeze excess water off bloomed gelatin and then mix into the hot sugar. With mixer on low, slowly pour hot sugar into the eggs whites. Once all the sugar is in, turn up to high speed and let whip until cool and shiny (this will probably take about ten minutes, that sugar is HOT). I used a piping bag with a round tip to pipe the fluff until it completely covered the top of the tart and then I used a small offset spatula to shape it how I wanted. You can pipe or spread in whatever design you want. Once all your tartlets are covered with fluff, you can either torch them or stick under the broiler for about five minutes to brown. I don't have a torch here, so I used my "fish drawer" which is basically the Korean version of a broiler. Serve immediately or store at room temperature up to six hours. Gluten free version: I'm fairly confident you could also do this as a casserole. Depending on the size of your casserole dish, you'd probably want to do one and a half times to double the recipe. Don't make a crust and omit the flour in the sweet potato filling. If you're serving it with the main course, don't double the fluff recipe, if you're doing it as more of a sweet potato pudding dessert, go to town. Our first stop: Budapest for pastry or a New York Jewish bakery's cookie jar by the register. I love pumpkin pie as it is, so I'm not saying you necessarily need to improve on it but pumpkin pie is one of my favorite things, and flaky rugelach miiiiight be my favorite cookie after chocolate chip and when you combine them together they make magic. This is a cookie for all the people out there like me who love the crust as much, or maybe even more, than the filling. Not too sweet, full of pumpkin and spice and as tender as can be, even if there's already a pumpkin pie on the table, no host will be mad if you show up with these as your Thanksgiving feast contribution. *For readers in Korea, or other expats: After discovering the canned pumpkin at the Foreign Food Mart had an expiration date of two years ago, I took a Korean green sweet pumpkin, cut it in half and scooped it, put it in a shallow baking pan with a bit of water, covered it with foil and put it in a 350 degree oven until it was tender and could be easily scooped away from the skin. Than I used my immersion blender to turn it into puree. Confession: That bottom middle picture is actually from a batch of peach rugelach, don't tell. Dump the dough onto a large piece of plastic wrap and pat into a rectangle. Wrap tightly and refrigerate for at least one hour. Easy Peasy. In a small bowl, whisk together your sugar plus all your spices and salt for even distribution. In another bowl whisk together your pumpkin and egg until fully incorporated. Whisk the sugar into the pumpkin egg mixture. Refrigerate until you're ready to use. Flour a large work surface. Remove the dough and the filling from the refrigerator. Divide the dough into third. Roll out one third into a rectangle just a bit thinner than you would for pie dough. Trim off any uneven edges and putting the trimmings aside. Spread 1/3 of the pumpkin mixture in a thing layer over the dough, leaving an inch uncovered across the bottom edge (I like to use an offset spatula to do this). Gently roll up, wrap in plastic wrap and refrigerate seam side down. Repeat for the remaining two third of dough, incorporating the scraps from the dough before. Bake 35-45 minutes until golden brown. Cool on a rack. Serve when cool or once cool, keep in an airtight container for up to two days. Okay, yeah, Beijing isn't known for it's Sichuan food but as China's capital city, access to different regional cuisines is pretty widely available and DEFINITELY more widely available than in Seoul where Chinese food is pretty heavily Koreanized. There are plenty of foreign food marts in my neighborhood but they mostly stock, American, European or Halal goods. We certainly didn't expect it to be so hard to find ingredients from other Asian cuisines in Seoul, so while we were in Beijing we hit up a supermarket to bring back some spices missing from our pantry. One of the things we were really excited to get our hands on was Sichuan peppercorns, we ended up with Ma Jiao, which is the green variety (and very conveniently were labeled "Ma Jiao" in English on the bag, though we could clearly tell by the smell we had found the right spice). The general consensus seems to be that the green peppercorns are a little more citrus-y, piney and mild in flavor than the red ones but they still have that tongue numbing punch. Infused into fat and mixed with flour, you won't quite get the same tongue tingle as if you're eating ma pa tofu with these cookies, but the unique flavor of Sichuan cuisine still comes through quite strong. Since there isn't much heat spice to the Ma Jiao, I finished these madeleines with cayenne sugar to add a little heat and get the full of Sichuan effect. Also, don't tell any friends you're trying to wow, but as impressive as these sound, they're actually pretty easy to make. Preheat your oven to 375. Remelt your infused butter, strain and set aside to cool slightly. Using a handheld or stand mixer with the whisk attachment, mix eggs and sugar just until combined. Add in flour and salt and mix again until just combined. Slowly stream in butter with mixer on low speed until completely incorporated. Melt another 2 ounces (half a stick) of butter. Generously brush each mold in your madeleine pan with melted butter. If using a large madeleine pan, fill each mold with a heaping tablespoon of batter and pop the tray in the oven. Bake for eleven minutes or just until they spring back from touch and are a very light golden brown. While the madeleines are baking, whisk together sugar and cayenne pepper. Remove the madeleines from the oven and let them cool in the tray on a rack for two minutes. Gently de-pan the cookies (I used a combo of a small offset spatula and my hands) and roll in the bowl of spicy sugar. Madeleines have a pretty short shelf life so serve warm or let cool on a rack before storing them in an airtight container for up to 24 hours. I first learned about the magic that is making funfetti from scratch when I was team leading a New York Care's cooking class in the Bronx. While my classes were ostensibly supposed to focus on healthy cooking, my Bronx class happened on the weekends and was three hours to create a whole meal including dessert (don't ever tell my East Harlem kids who met for one hour after school and only got to make desserts near the holidays). I tended to focus my classes on familiar foods for which I could buy all the ingredients at the local Pathmark but made from scratch. So, corn flake crusted baked chicken tenders, take out style fried rice and chow mein, mac and cheese, etc and then occasionally throw in something new, like kale chips. (Seriously, these kids loved kale chips, one semester we made them at least four times by request). The first time I made funfetti cake, we made it using leftover ricotta from the lasagna that was our main course. Yep, I took a ricotta based cake, which sounds pretty adult and fancy and I funfettied it. Because it turns out, all you need to do to make a cake "funfetti" is add a cup (more or less) of sprinkles to whatever white or yellow cake you're making and you'll get those confetti dots inside when it bakes up. Last week I got a freelance request for a friend's husbands birthday for a cake shaped like America. When I asked the flavor, my friend said "not chocolate-y and moist". At first I offered a vanilla and lemon curd cake but then I asked if she wanted to go all out American and have a funfetti cake. This cake was maybe one of the most ridiculous things I've ever made and a resounding success. Preheat oven to 350. Grease and flour a 9"x13" (quarter sheet sized) cake pan. Combine dry ingredients and set aside. Cream butter and sugar until light and fluffy and then add eggs, one at a time, incorporating well after each addition. Mix in vanilla extract and lemon juice. 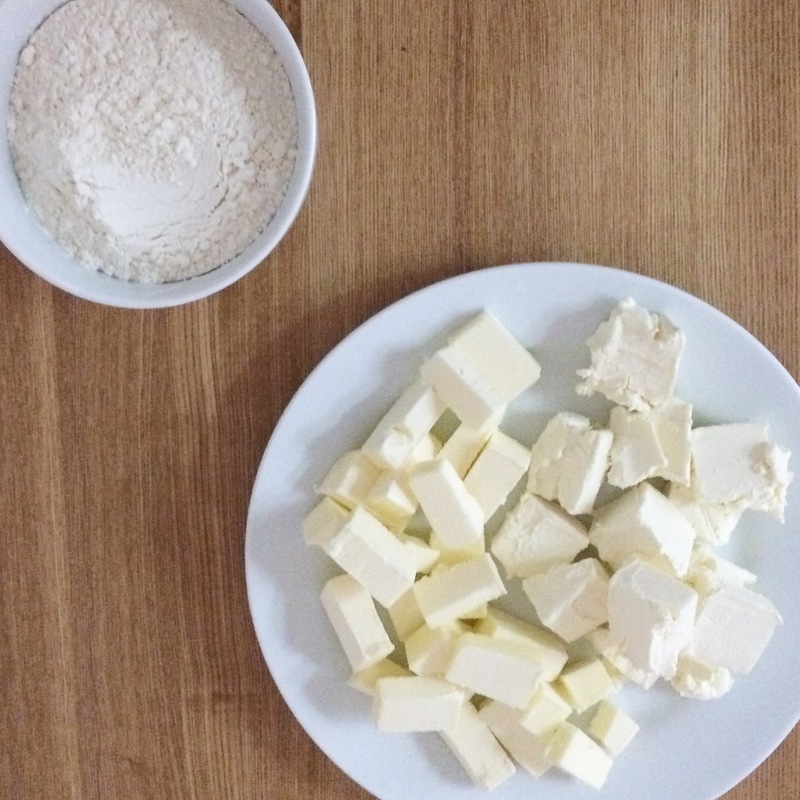 Mix in flour in two parts with the mixer on low and then mix on high for three minutes to aerate the batter. Fold in sprinkles. Spread the batter evenly in the pan and bake for 25-30 minutes until golden brown and just starting to pull away at the edges. Cool in pan for ten minutes on a wire rack and then invert directly onto the rack and cool completely before assembly. Cream together butter, salt, vanilla and five cups of powdered sugar until smooth and fluffy add up to two cups more powdered sugar for your own personal consistency and taste. Mix in the sprinkles. You've just made funfetti frosting. Try not to make it every day now. Of course, you have a couple of options here. You could just frost the outside of the cake and leave it at that or you could cut it in half and frost the middle and outsides, you could turn it in to one big U.S.A or you can make a smaller, double layered U.S.A. which is the option for which I'm writing instructions. Cut your cooled cake in half. Place one layer on a cakeboard and spread with a generous even layer of frosting, place the other half on top. Stick this in the fridge for fifteen minutes to firm up. Draw or print an outline of America (or any shape you want) that will fit within the dimensions of the cook hanging out in the fridge. Cut out the outline. Remove the cake from the fridge and place the outline on top, you can use a couple of dabs of frosting to hold it in place if you want. Use a paring knife to cut around the outline. Remember, you don't have to do this all in one go, use the picture in the upper right square as an example for how to cut parts of the coastline away. The sides of the cake are going to be pretty crumbly, so this is a time when it's pretty crucial to crumb coat your cake. Crumb coating is when you spread a thing layer of frosting over your entire cake to act as a base layer to seal in the crumbs so they don't mix in with the frosting. After you've crumb coated the cake, stick it back in the fridge for another fifteen to twenty minutes to set up. After your cake has set up, give it it's final, generous layer of frosting, on a cake this size, you're bound to lose some of the details of the coast (sorry, Puget Sound) try not to worry about it too much, I promise your guests (or client) won't care. This cake can be stored at room temperature if your house isn't too warm but in the Summer months I'd recommend sticking it in a sealed container in the fridge. 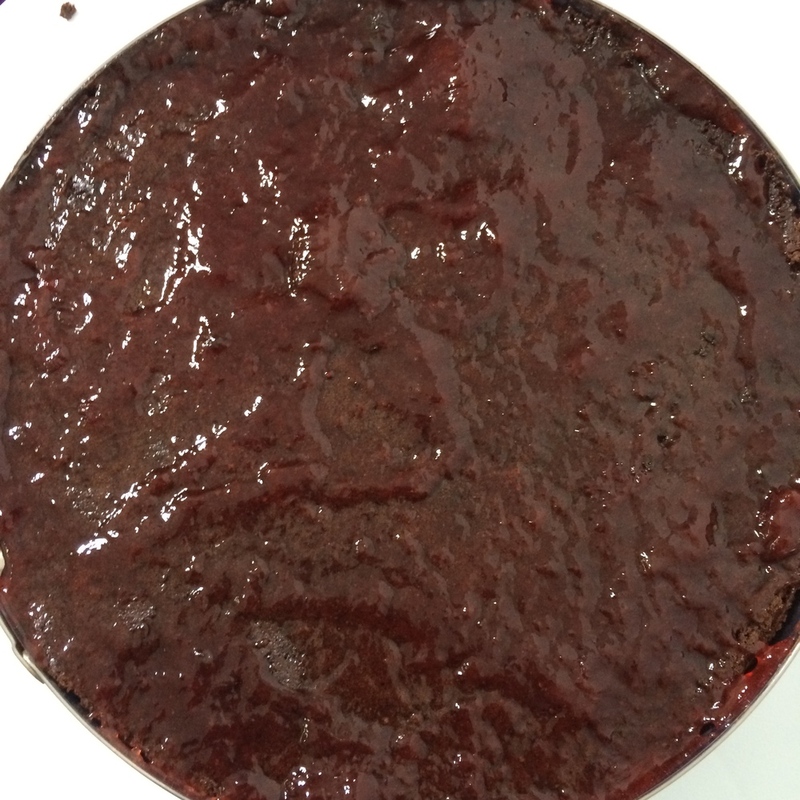 Am I posting this flourless chocolate cake recipe because it's Pesach? Yes. Yes I am. But you certainly don't have to be observing or even a member of the tribe or believe gluten is the root of all evil to enjoy the rich decadence of this cake. 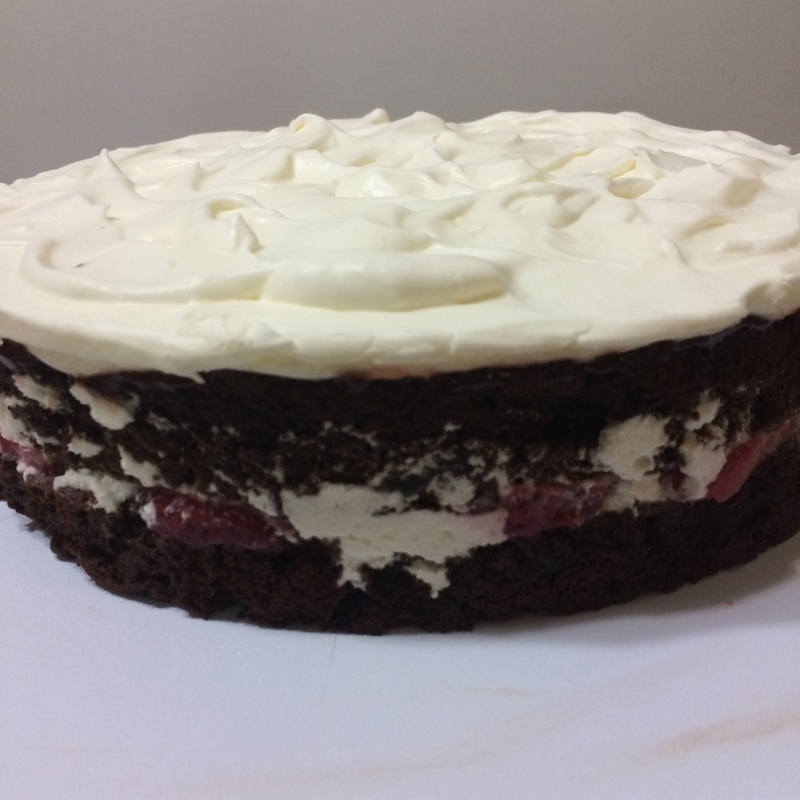 You can, of course, replace the flourless chocolate cake in this recipe with your favorite chocolate sponge, but the intensity of this cake contrasted with the sharpness of the whipped sour cream is what really takes this cake up a notch from Birthday Party to Plated Dessert. You'll notice in this recipe I use gelatin to stabilize the whipped sour cream to allow me to build this cake in a ring mold. You can omit the gelatin but it means you'll probably want to build this cake right before serving, with a more rustic, icebox cake look or just serve it as slices of cake with a dollop of whipped sour cream and fresh strawberries on top. 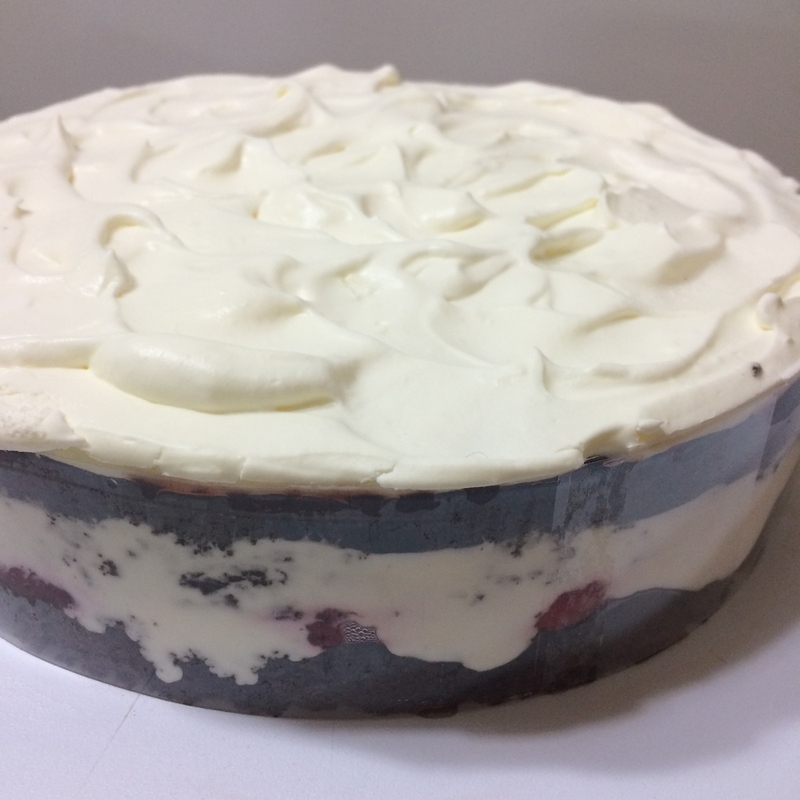 If you just don't have a ring mold or like the idea of plating better, but still want to do as much as possible in advance, keep the gelatin in the recipe and the stabilized whipped sour cream should hold in the fridge for about twenty four hours. This cake is incredibly rich, so even though it's only a nine inch round, I'd say it serves about 15-18. 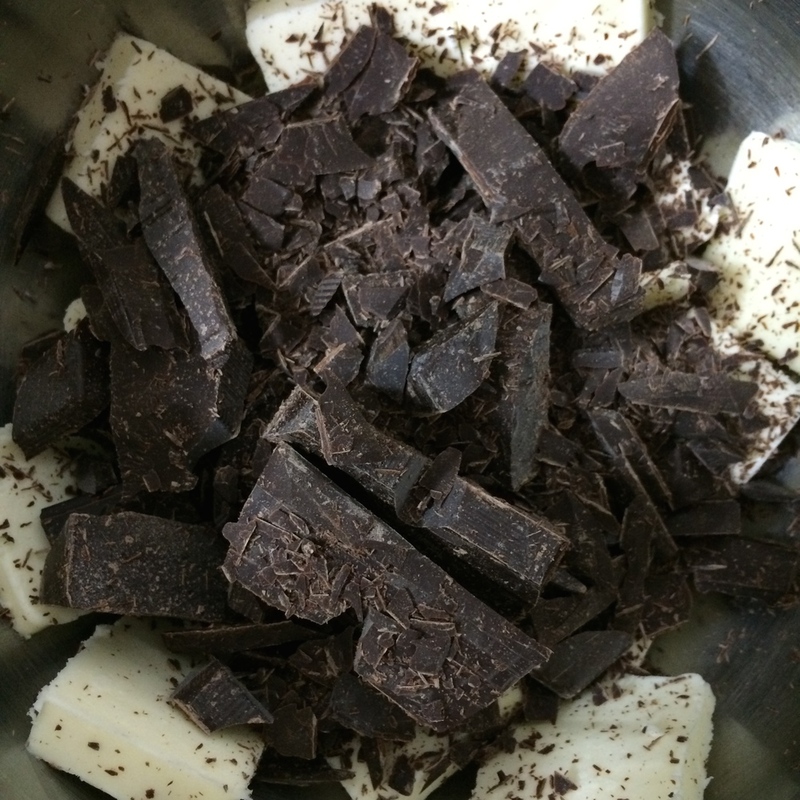 Using a double boiler, melt together your butter and chocolate. I always line my bowls with the butter before putting in the chopped chocolate as an extra precaution against burning. Once completely melted, whisk in one cup of the sugar and set aside. Using a stand or hand mixer (or a whisk and a lot of elbow grease) whisk the eggs and remaining half cup of sugar to ribbon stage. Reduce the speed to low and slowly pour in the melted chocolate mixtures. When the chocolate mixture is most of the way incorporated, whisk in the cocoa powder and salt. Divide evenly between the two prepare pans. Bake for twenty to twenty five minutes or until a tester poked in the middle comes out with moist crumbs. Cool cake for ten minutes in the pan before removing and cooling completely on a rack. Bloom sheet gelatin in cold water. With the mixer on low speed, drizzle the gelatin into the whipped cream. Add in the sour cream and mix until incorporated. Put your ring on a cake board and line with a cake collar (acetate strip). Carefully place your bottom cake layer inside the ring. Arrange strawberries in an even layer covering the cake. Scoop half the whipped sour cream over the strawberries and use a small offset spatula to spread and smooth. Carefully place your second layer inside the ring. In a small ramekin, heat strawberry jam for twenty seconds in the microwave. 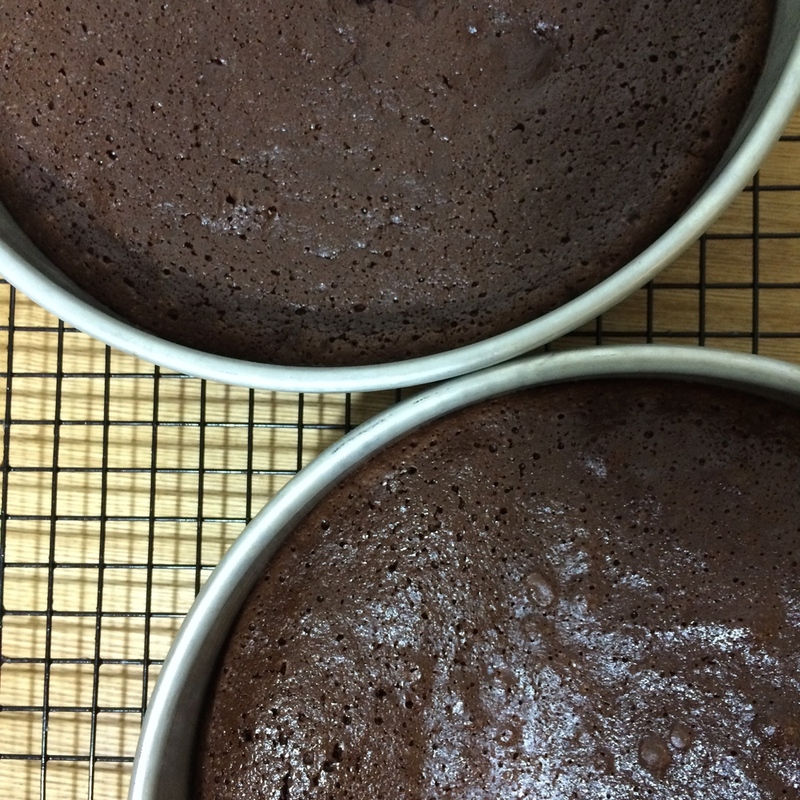 Use a small offset spatula to spread a thin layer over the cake. Let cool. Scoop remaining whipped sour cream over the top of the cake. Use a large offset spatula to make a smooth top or use a smaller one to make swirls for a textured look. Cover in a cake dome and refrigerate for at least one hour or up to twenty four. Remove acetate strip and slice. This is definitely a cake where you want to have some hot water to clean your knife between every cut.